Compaction of sintered metal powders by free upsetting at room temperature dangerously reduces their plastic properties, particularly the fracture toughness. The reason for the occurrence of two unfavorable phenomena accompanying this deformation route is sought. The first phenomenon depends on the initial porosity of the preform and the amount of cold work resulting in the destruction of bonds and violation of continuity between sintered powder particles. The second phenomenon is the deformation of the metal matrix, which reduces the plasticity of the sintered product. 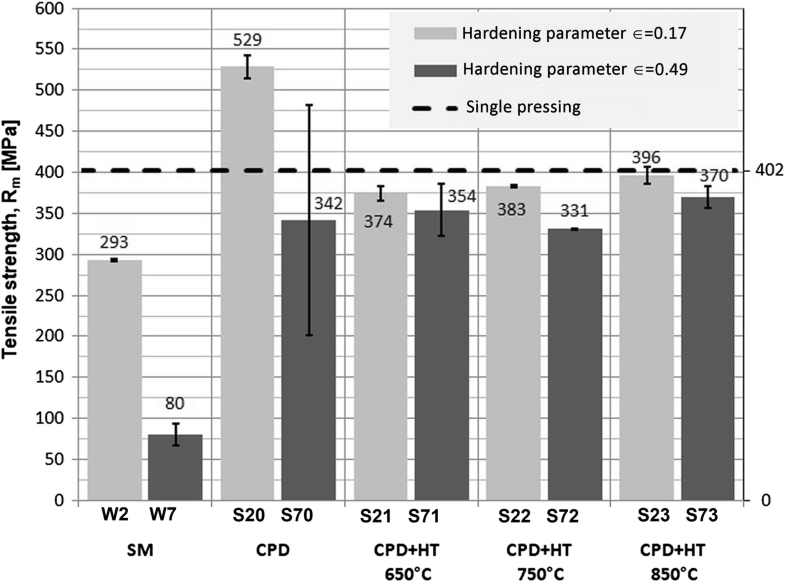 To correctly assess the effect of changes occurring in the matrix as a result of deformation, it is necessary to use the properly defined sintered matrix hardening parameter discussed in this study. The adverse effects of cold forming can be eliminated by annealing the deformed sinters at a temperature below the sintering point and above the recrystallization temperature. The annealing temperature causes favorable changes in the structure and increases the impact resistance of the deformed sinters depending on the degree of deformation of the sintered matrix and the initial porosity of the preform. Annealing at a properly selected temperature restores the ductility of the metal matrix and improves the integrity of the sintered material impaired by the effect of deformation. Annealing also causes favorable changes in the porosity morphology, removing defects in the form of gaps and resulting in the spheroidization of voids. With an appropriately selected initial porosity and degree of deformation, subsequent annealing of sinters compacted by free cold upsetting provides products with strength properties comparable to sinters with the same density and subjected to single compaction and sintering but with considerably higher fracture toughness. One of the specific characteristics of sintered materials is their ability to undergo irreversible volumetric and dimensional deformations. A favorable increase in density can only be achieved in these deformation processes, for which the condition of negative mean stress (σm < 0) is fulfilled both globally and locally. Otherwise, in areas where σm > 0, the porosity increases, which can impair the cohesion during forming. Therefore, in the plastic forming of sinters, processes characterized by large negative values of mean stresses are preferred. These processes include different types of isostatic pressing, closed die forging and extrusion. All of these processes ensure a significant increase in density. Among the numerous methods that allow the manufacture of sintered products with a density equal to that of solid materials, research on techniques using plastic forming to increase density and obtain the required properties of sintered products is still being carried out. These techniques are for cold plastic deformation (CPD), including repressing, forging and rolling of sintered preforms, as well as sizing, coining and burnishing of final products (Ref 1). CPD applications allow obtaining higher densities and properties superior to the properties of products manufactured by the traditional single pressing and single sintering method. Interesting research results on the use of surface rolling to improve the load-bearing capacity of presintered gears are presented by Takemasu et al. (Ref 2). Narayan et al. describe research on the workability of iron powder-based preforms, cold upset and sintered by the traditional method of powder metallurgy (Ref 3, 4). 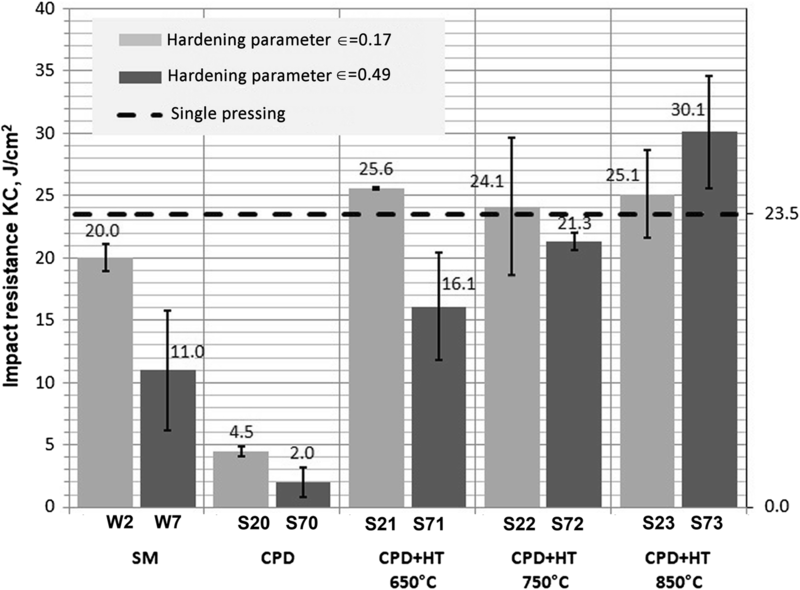 The choice of conditions for sintering steel preforms and the optimization of parameters for their compaction under cold forging conditions is presented by Kamakoshi et al. (Ref 5). To improve dimensional accuracy, calibration presented in different variants by Nowacki in Ref 6 is often used. CPD processes are also combined with annealing or resintering. A well-known method for producing sintered high-density metal products is the “double pressing/double sintering” (DP/DS) technique patented by James et al. (Ref 7). 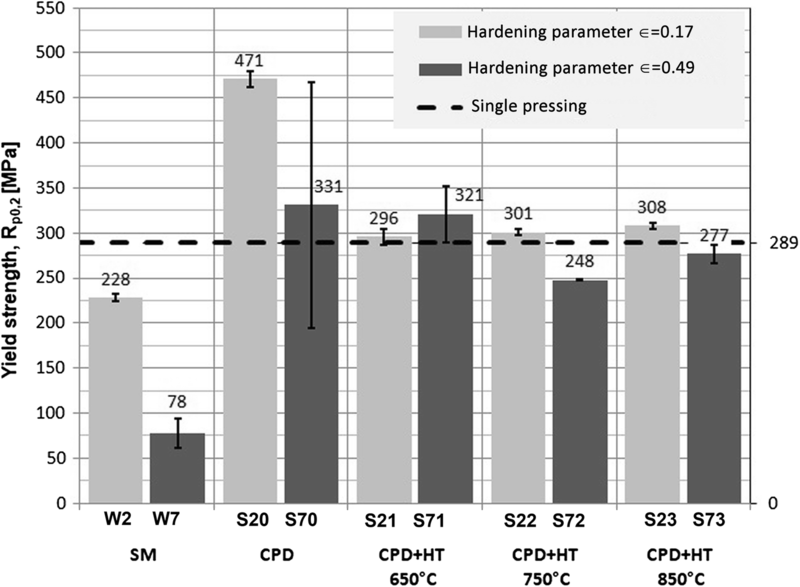 Research on the use of hot isostatic pressing and double pressing to obtain full-density products is presented by Khodaee et al. (Ref 8). 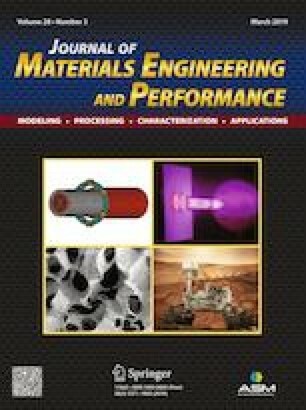 The positive impact of the double pressing/double sintering technique on the mechanical strength and tribological parameters of bearings made of self-lubricating composites is discussed by Hammes et al. (Ref 9). In turn, Recknagel et al. describe the effect of temperature used at individual stages of compaction during DP/DS on the properties of products based on iron powder (Ref 10). The volumetric strain during CPD changes the density as well as the size and shape of voids, while nondilatational strain affects the metal matrix, resulting in the state of cold work and strain hardening. However, if the starting porosity of a sinter is high, the improvement of properties may not occur despite the application of large deformation and fulfilling the condition of a negative mean stress value. As demonstrated by Kosoń-Schab in her studies (Ref 11), sinters after CPD show very low impact resistance and elongation combined with a significant reduction in tensile strength compared to compressive strength. In turn, Zarebski et al. demonstrate in Ref 12 that the improvement in cohesion and elimination of the negative effect of the strain hardening of the metal matrix manifested in the improved plastic properties of the deformed sinter can be obtained by the application of recrystallizing annealing. Proper design and efficient use of the cold forming of metal sinters require knowledge about the combined effect of the porosity and the matrix hardening rate on the structure and properties of the processed sintered material. The effect of porosity on the mechanical properties of sintered metal powders is well studied and well known. Numerous studies are also available that describe, mainly qualitatively, changes occurring in the morphology of sintered voids and the metal matrix due to cold plastic deformation. In the available literature, however, there are no studies in which these changes would be quantified as a function of the correctly defined degree of sintered matrix deformation. In the studies discussed in this article, it has been assumed that the loss of plastic properties is caused by two phenomena that occur during CPD. The first phenomenon is the violation of cohesion at the particle boundaries, related mainly to the initial porosity and the amount of cold work. The second factor determining the properties of the sinter is the metal matrix hardening rate, which depends on the degree of deformation. In the analysis of the hardening effect observed in porous sintered metals, the degree of deformation of the specimen cannot be expressed in terms of the relative or true strain because dimensional changes are the result of changes in both porosity and the sintered matrix. The correct description of the matrix hardening degree requires the definition of the equivalent matrix strain related to the amount of cold work applied to the sinter. Tests were carried out to determine the effect of annealing on the structure and mechanical properties of sinters subjected to controlled cold deformation. As a primary parameter controlling the amount of cold work, a properly defined equivalent matrix strain was used. This parameter allowed combining the degree of the sintered matrix deformation and the initial porosity of the preforms with the negative effect of cold forming. 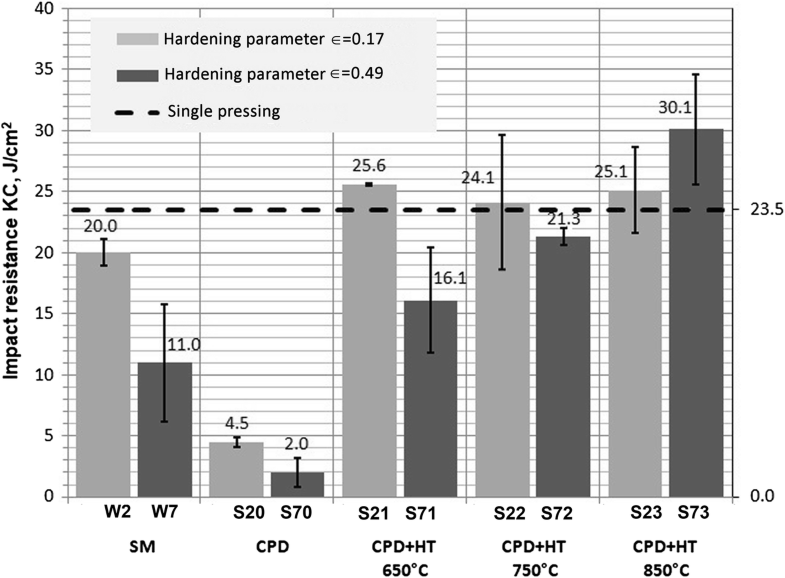 Assuming that properly conducted heat treatment should eliminate the undesirable effects of CPD, studies have focused on the relationship between the annealing temperature, changes in the porosity and the impact resistance of deformed sinters. Special attention was devoted to the examination of fracture surfaces combining the results obtained with the results of impact tests carried out on sintered preforms before and after cold deformation, with or without the application of recrystallizing annealing. Based on these results, the effect of the applied technological treatments on the impact resistance and fracture mechanism occurring in products sintered from PNC-60 iron powder was described. The analysis also covered the microstructure and selected mechanical properties. Fracture analysis is a very effective method for assessing the impact of manufacturing methods on the possible occurrence of damage in products operating as parts of machines and equipment. 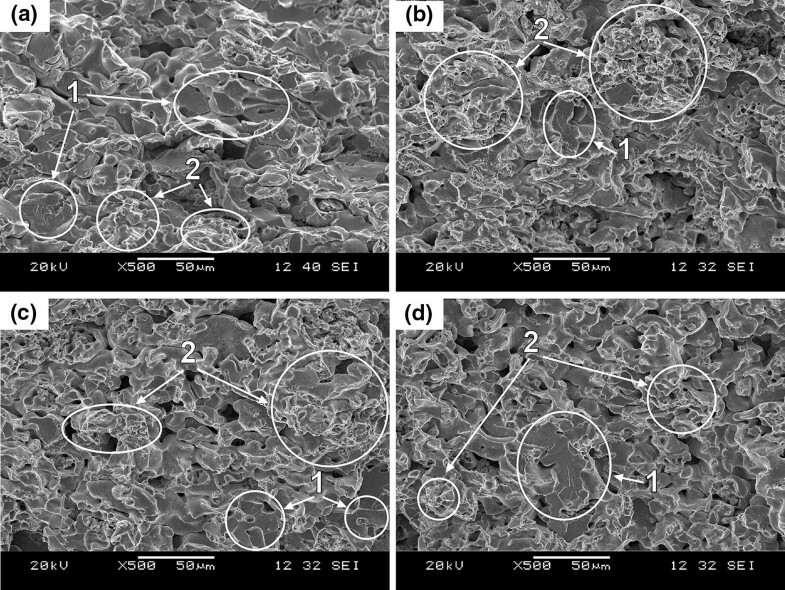 Microscopically, the fracture mechanism in porous sintered metals is similar to that of solid materials. However, this fracture mechanism is more complex because, in addition to grain boundaries and interfaces, there are also structural discontinuities in the form of pores. These discontinuities can be individual pores enclosed in grains or at grain boundaries, as well as pore agglomerates located at the boundaries of adjacent powder particles. Compared to solid metals, sintered powders contain more sites for potential crack nucleation, and further crack development may follow different routes. In sintered materials, the topography of fractures is more developed than that in solid materials. When the progressing crack encounters a void in its way, it can change the direction and develop in several different directions, or its development can be arrested. The consequence of these actions is the formation of a network of cracks increasing the fracture surface. Extensive fracture analysis and interpretation of the fracture mechanism operating in various sintered steels were presented by Dudrová and Kabátová (Ref 13, 14). 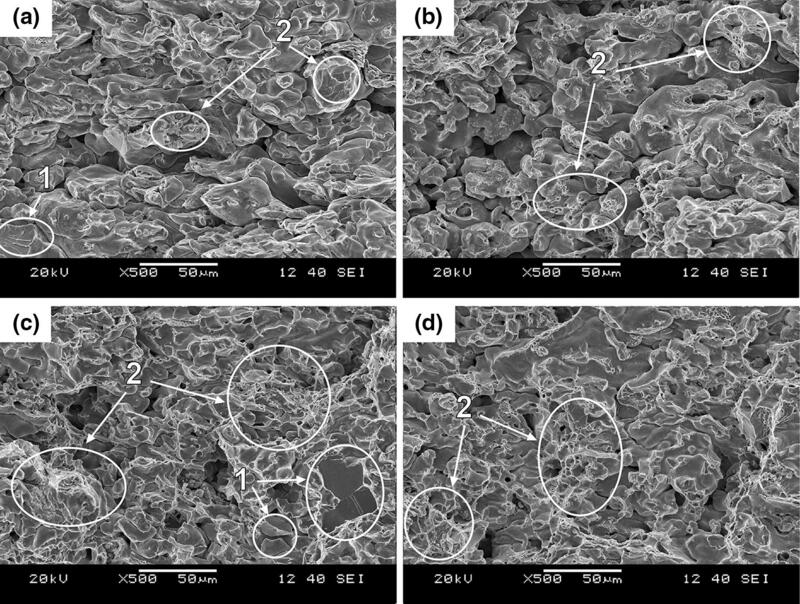 The effect of sintering parameters and carbon content on the porosity, mechanical properties and fracture characteristics in sintered Cr and CrMo steels was presented by Kulecki et al. in Ref 15. The experimental studies presented in this paper include two factors, i.e., the heat treatment temperature (Ta [°C] and the equivalent matrix strain (∈). This approach is not found in other works, where the effect of plastic deformation on the properties of sintered products is described only in terms of the degree of deformation, neglecting the sintered matrix hardening parameter. With fixed values of the test parameters (Ta and ∈), any comparison of the properties and structure of sinters subjected to plastic deformation and heat treatment requires the same final porosity (Θk = const). To achieve this goal, the test methodology and sample preparation technique described in section 2 are used. Sintered preforms were made from a PNC-60 mixture based on NC 100.24 powder with a low (not exceeding 0.06 wt.%) content of carbon and the addition of ferrophosphorus giving 0.6 wt.% of phosphorus, which intensifies the sintering process and improves the quality of bonds formed between powder particles. Due to its high-strength properties and high satisfactory ductility, PNC-60 is widely used in the manufacture of parts for the automotive industry. A lubricant (Kenolube P11) was added in an amount of 0.5 wt.% to the mixture. Sintering was carried out in an atmosphere of hydrogen at 1120 °C for 1 h.
The preforms for further compacting were shaped as cuboidal bars with initial dimensions (width a0 = 10 mm, length l0 = 60 mm and height h0) depending on the initial required porosity determined in accordance with the methodology given in section 2.1. Pressing was performed under the conditions of minimized friction using Teflon sheets coated with graphite lubricant, which separated the specimens from the anvils. The pattern of preform deformation is shown in Fig. 1. Multiple pressing of sinters increases their density and causes changes in the sintered matrix. Therefore, the correct description of the deformation effect should include not only the value of the density, but also the value of the sintered matrix hardening parameter, which depends on the value of the strain. This description requires determination of the parameters of plastic forming, taking into account the initial and final porosity and the degree of deformation. For this purpose, the method given by Okoński in Ref 16 based on the plasticity condition in Eq 1 was used. where ρ is the sinter density and ρL is the matrix material density. For the porosity functions α(Θ) and β(Θ) described by Eq 3 and 4, respectively, the coefficients k and b have been determined empirically by Kielkucki et al. (Ref 17). For PNC-60 powder, k = 1.94 and b = 5.26. The equivalent strain of the sintered matrix, otherwise called the sintered matrix hardening parameter, was determined from Eq 5, while the strain in uniaxial compression or tension was determined from Eq 6. In Eq 6, γ is the cold work ratio, and h0 and h1 are the compact initial height and final height, respectively. Calculation of the initial porosity and the degree of deformation is based on the adopted values of the sintered matrix hardening parameter ∈ and final porosity Θ1. First, using the method of successive approximations, the lower limit of integration Θ0 at which integral (5) reaches the assumed value ∈ for the assumed final porosity Θ1 is determined. Then, from Eq 6, the cold work ratio γ and the true strain of the sinter ε = lnγ are calculated. For the set value of cold work and the assumed final height h1 of the compact, the required initial height h0 of the preform is derived. 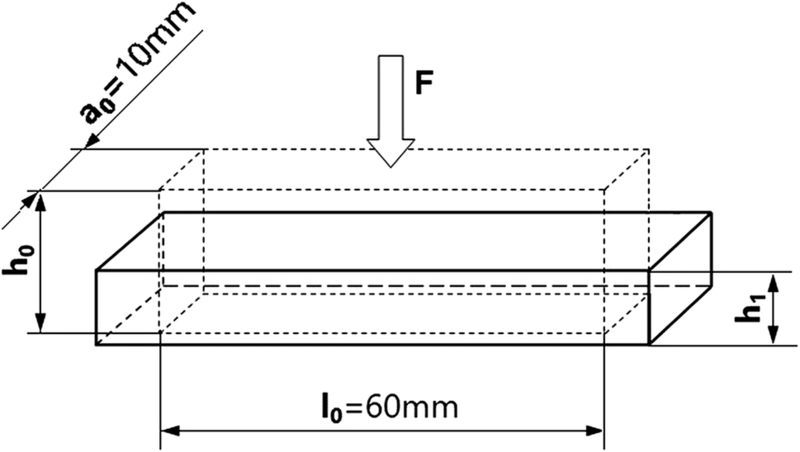 The adopted value of the final porosity was Θ1 = 0.12, and the dimensions of the preforms in the shape of bars were 10 mm × 60 mm × h0. The deformation was achieved by uniaxial compression to obtain compacts with a final height of h1 ≈ 10 mm. Two values of the sintered matrix hardening parameter were assumed, i.e., ∈ = 0.17 and ∈ = 0.50, with the corresponding logarithmic strain of the sinter ε = 0.24 and ε = 0.77, respectively. Preforms for the deformation where ε = 0.24 were designated as W2 and for the deformation where ε = 0.77 as W7. The samples after deformation were designated as S2x and S7x, respectively, where “x” represented the annealing temperature designated as 0 (without annealing), 1 (650 °C), 2 (750 °C), or 3 (850 °C). The designation SF denoted a sinter with porosity equal to the final porosity obtained without additional plastic forming. For example, sample S73 denotes the sinter subjected to strain ε = 0.77 and later annealed at 850 °C. The tensile strength Rm, the yield strength Rp0.2 and the elongation A5 were determined in a static tensile test on cylindrical, fivefold samples with an initial diameter of ϕ = 5 mm that were machined by turning from pressed and compacted specimens. Impact tests were carried out on unnotched samples using a Charpy hammer with an initial energy of 150 J. Fractures surfaces were examined under a JOEL JSM 646LV scanning electron microscope. Microstructure images were examined under a Nikon Eclipse ME600P optical microscope on metallographic sections etched with 4% nital solution. The porosity and mechanical properties of the samples before deformation and after single pressing and sintering are given in Table 1. Table 2 compares the conditions of deformation described by the matrix hardening parameter and the logarithmic deformation, postupsetting porosity and mechanical properties of products subjected to deformation and different cycles of heat treatment. Θ1—final porosity, ε—logarithmic strain, ∈—matrix hardening parameter. The porosity was calculated after each step in the test using Eq 2, with the sinter density determined by the geometric method. All results of the mechanical tests are displayed as the mean values within the confidence intervals for the adopted level of significance equals 0.1. 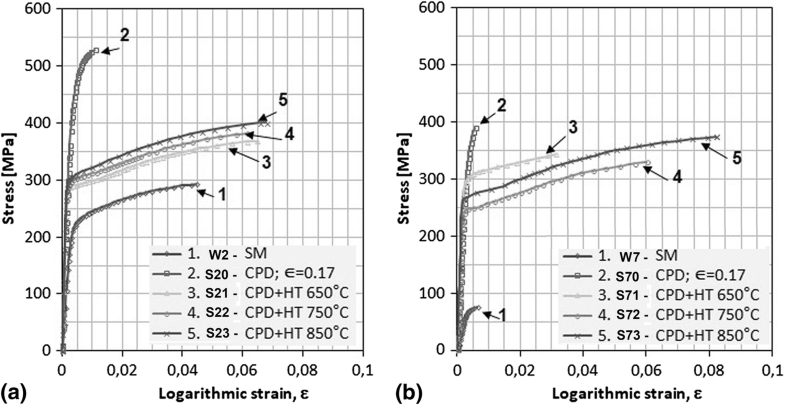 The effect of plastic forming and heat treatment on selected mechanical properties of sinters is shown in Fig. 2, 3 and 4. The horizontal dashed line shows the value of a given property for the sinter designated SF, which after single pressing and sintering has already achieved a similar density as the samples subjected to densification. Selected tensile curves plotted for sinters before and after deformation and for sinters after deformation and annealing are shown in Fig. 5. The properties after densification and subsequent annealing depend on the deformation rate applied. With regard to the starting material, densification with a matrix hardening parameter of ∈ = 0.17 results in an increase in both tensile strength and yield strength. The tensile strength Rm increases from 293 to 529 MPa, and the yield strength Rp0.2 increases from 228 to 471 MPa. Both of these values are also higher than those for sinters with the same porosity after single pressing and sintering, where the respective values are Rm = 402 MPa and Rp0.2 = 289 MPa. However, the improvement in mechanical properties is accompanied by a significant reduction in the impact energy, i.e., from 20.0 J/cm2 for the preform to 4.5 J/cm2 for the sinter after deformation. Compared to the sinters after deformation, annealing at 650 °C reduces the strength properties, and Rm = 374 MPa. With increasing annealing temperature, the tensile strength also gradually increases, reaching Rm = 396 MPa after annealing at 850 °C, but even this value is inferior to the tensile strength obtained in sinters not subjected to densification. The effect of the annealing temperature on the yield strength is similar, but the value obtained is always higher than that in the sinters after single pressing and sintering. The highest value, i.e., Rp02 = 308 MPa, was recorded in sinters annealed at 850 °C. Annealing at 650 °C raises the impact resistance to 25 J/cm2. This value is slightly higher than that for sinters without additional treatment, for which the reported value is 23.5 J/cm2, and does not change significantly despite the use of a higher heat treatment temperature. The tensile curves in Fig. 5(a) clearly show the effect of deformation on the increase in strength and decrease in ductility of the pressed preforms. The annealing effect, which depends on temperature, causes a gradual increase in elongation and strength. In the sinters deformed with high strain corresponding to the hardening parameter ∈ = 0.49, a visible drop in the impact strength was noted, i.e., from 11 J/cm2 for the preform before deformation to 2 J/cm2 after deformation. Annealing the deformed material increases the impact resistance, and this increase occurs gradually with the increase in the annealing temperature. After annealing at 850 °C, an impact resistance of KC = 30.1 J/cm2 was obtained, i.e., higher than that in the sinters with the same final porosity but not subjected to densification. The results of the measurements of tensile strength and yield strength on samples after large deformation are very significant. These results are characterized by a very large scatter, which is the effect of the low cohesion of sinters due to upsetting. Annealing these sinters has no major effect on the average value of the strength properties, but visibly reduces the scatter in the results obtained, which may indicate a gradual recovery of cohesion impaired by deformation. Finally, after annealing the deformed material at 850 °C, tensile strength and yield strength values of Rm = 370 MPa and Rp0.2 = 277 MPa, respectively, were obtained, and these values are lower than those in the sinters after single pressing and single sintering and after densification with a lower degree of deformation and annealing at the same temperature. The tensile curves plotted for these sinters (Fig. 5b) show that the elongation increases with increasing annealing temperature, and this result confirms the recovery of plastic properties. Apart from the temperature of 650 °C, for which, as already mentioned, the scatter of properties was very high, the temperature increase from 750 to 850 °C resulted in a strength increase. Evaluating the results of tensile and impact tests carried out on sinters after deformation, it is necessary to take into account the technique of sample preparation, specifically the orientation of elongated pores relative to the force direction. In samples tested for tensile strength, this orientation was parallel, while in samples tested for impact resistance, this orientation was perpendicular to the direction of the force applied, which additionally contributed to the low impact test results. Sinters subjected to densification show changes in the porosity characteristic of cold plastic forming. The voids are closed, and their shape is elongated, indicating the direction of the largest deformation. In the images of the microstructure that are presented, several selected pores are marked to indicate the nature of changes that occur in pore size and shape as a result of deformation and annealing. The grains in the sintered matrix are also elongated, and some of them undergo the process of fragmentation as a result of the effect of a large deformation. Micrographs show transverse sections of the samples. Figure 6 shows examples of micrographs of sinters before and after compaction with the equivalent matrix strain ∈ = 0.17. The sinters are designated as W2 and S20, respectively, and as S21 and S23 after annealing for 1 h at 650 and 850 °C, respectively. Even a small strain causes visible changes in the shape of the pores. In the starting material (Fig. 6a), the pores are mostly irregular in shape, but pressing makes them flat and elongated (Fig. 6b). Similar changes are observed in the shape of the powder particles; they are elongated and indicate the direction of the largest deformation. 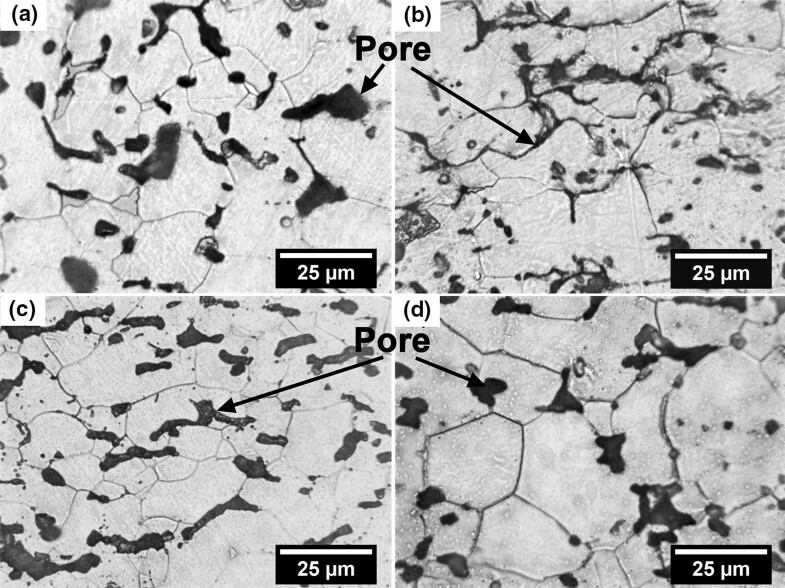 The elongated pores shown in the micrographs were not completely closed by pressing, and the distance between powder particles was too large to allow new bonds to be formed during annealing. At 650 °C, the growth of grains was limited, and their shape and size depended on the presence of voids inhibiting this growth. Raising the annealing temperature to 850 °C eliminated the elongated pores completely and initiated the grain growth process in the matrix. The size of these grains was larger than that in the case of annealing at 650 °C. The pores underwent spheroidization, and some of them were located inside the grains. The micrographs in Fig. 7 show sinters before deformation and after deformation with the matrix hardening parameter ∈ = 0.49 and after annealing for 1 h at 650 and 850 °C. The porosity of the starting material was high, and the voids had irregular shapes (Fig. 7a). Due to their large initial size, the pores were only partially closed after the deformation process, and voids with clearly elongated shapes remained between powder particles (Fig. 7b). Annealing at 650 °C resulted in the recovery of the microstructure, typical of the recrystallization process (Fig. 7c), but the void morphology was different than that in the sinters after low strain deformation. Annealing at this temperature did not completely eliminate the elongated pores, but it assisted the formation of single bridges between powder particles and local fusion of the matrix. After annealing at 850 °C, the microstructure was nearly the same as that in sinters after low strain deformation. Figure 8 presents typical impact fractures observed in the tested iron sinters. Figure 8(a) shows the surface of a transcrystalline fracture running through a powder particle, while Fig. 8(b) shows the surface of an intercrystalline fracture. Fracture surfaces intersect the pores located mostly at grain boundaries. In the area of the occurrence of clusters of interconnected pores, in the necks connecting powder particles, fractures are formed, which develop according to brittle intercrystalline or transcrystalline mechanism shown in Fig. 8(c). Occasionally, ductile fractures are also formed as shown in Fig. 8(d). In comparison with the combined powder particles, the cross section of the necks formed during sintering is much smaller. For this reason, in the area of the necks, the degree of plastic deformation is very high. When deformation is no longer possible, the necks separate, showing numerous depressions and sharp ridges typical of ductile fracture. Often, the nuclei of these cracks are small pits enclosed in the necks during sintering. Figure 9 shows the changes that occur on the surfaces of fractures formed in samples after deformation by ε ≈ 0.24 (Fig. 9a) corresponding to the matrix hardening parameter ∈ = 0.17 and after annealing for 1 h at 650, 750 and 850 °C (Fig. 9b, c and d). In the sinters after deformation (Fig. 9a), the brittle fracture mechanism is dominant. Numerous areas of cleavage fractures running along the boundaries of particles and transcrystalline fractures with characteristic “river basin” lines are visible. Both pores and powder particles have an elongated shape and clearly indicate the direction of the largest deformation. Most of the pores are closed, but permanent connections have not yet been formed between powder particles, and along these pores, the fracture surface develops. Figure 9b shows the effect of annealing at 650 °C, which has almost completely removed the effect of upsetting in the matrix, and the shape of the particles does not indicate any earlier deformation. Macroscopically, the fracture is brittle, with local areas of plastic deformation usually preceding crack formation in the necks. In places where compressed pores are present, new necks are formed and serve as bonds for powder particles. The improvements in cohesion and matrix recrystallization, accompanied by decreases in internal energy and grain fragmentation, contribute to the increase in stress necessary to break the bonds between particles and thus increase the impact resistance. Raising the annealing temperature to 750 °C causes only insignificant changes in the fracture topography (Fig. 9c). The compressed voids are no longer visible, and there are no signs of any visible discontinuities associated with matrix deformation. The image of the fracture surface annealed at 850 °C is similar (Fig. 9d), but the dimensions of the transcrystalline interface area indicate large sizes of the grains in the sintered matrix. Increasing the annealing temperature promotes pore spheroidization. 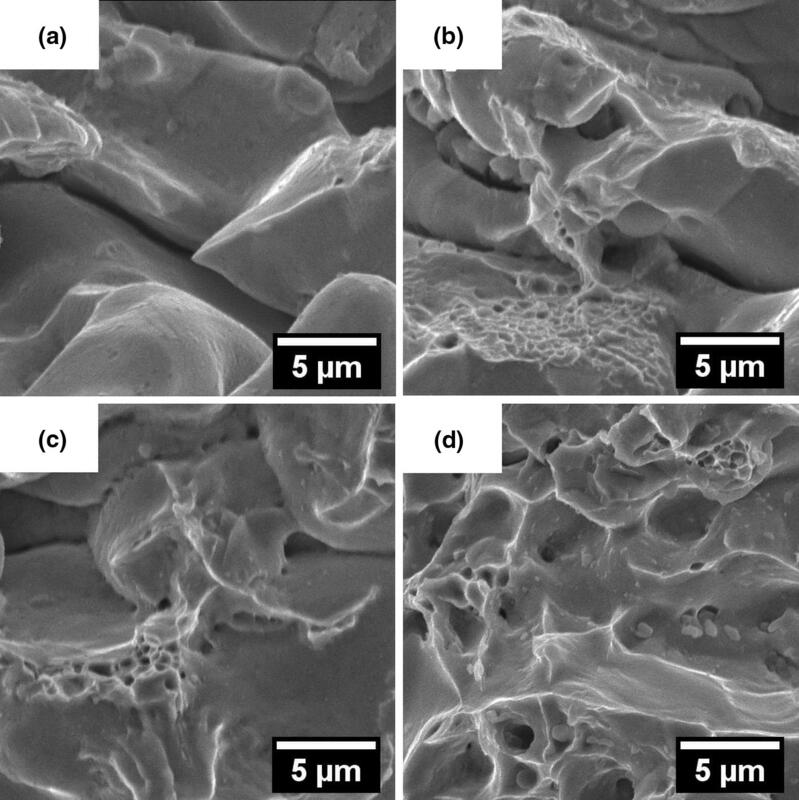 Figure 10 shows micrographs of fractures observed in sinters upset by ε ≈ 0.77 with matrix hardening parameter ∈ = 0.49 without additional heat treatment (Fig. 10a) and after annealing for 1 h at 650, 750 and 850 °C (Fig. 10b, c and d). The large deformation and the high initial porosity almost deprive the upset sinters of their original fracture toughness. Deformed particles, broken bonds between these particles and compressed large pores are visible in the fracture (Fig. 10a). However, the compression of pores is not sufficient to cause permanent fusion of particles, and the fracture surface runs through these areas of weak cohesion. The fracture has a brittle character; the fracture preceded by plastic deformation is ductile only in places where single bridges formed during sintering to connect the powder particles. The following images show how annealing changes the fracture surface and reveal the ductile fracture mechanism in the areas where new connections are formed between powder particles. The fracture of the sinter annealed at 650 °C (Fig. 10b) still shows the presence of particles and pores with their shape altered by upsetting. The surface of the fracture runs through the newly formed necks, some of which show the cleavage mode of the fracture, while others undergo plastic deformation before cleavage, resulting in the occurrence of local areas with the ductile fracture mode. The sites of crack onset are pores closed during recrystallization at the grain boundaries. 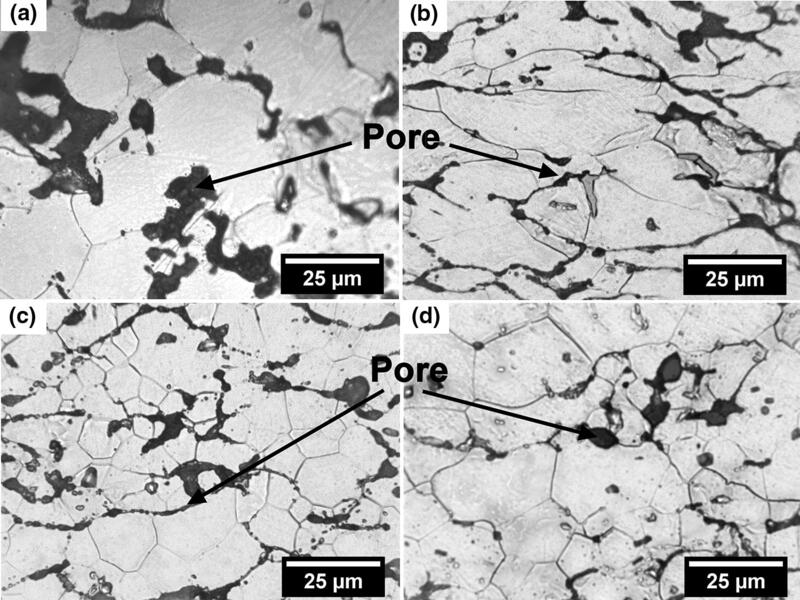 Macroscopically, the fracture mode in the sample annealed at 850 °C can be described as brittle, but with numerous local ductile areas located near the contact points (Fig. 10d). The mechanical properties of cold-deformed metal sinters depend on the initial porosity and the severity of the applied deformation. When the preform porosity is high, large pores and few connections formed between powder particles during sintering result in low mechanical properties. Deformation naturally increases the preform strength since it increases the density and hardens the sintered matrix, but the values obtained are still lower than those obtained for a sinter with the same density but not subjected to repressing. Better results are obtained when preforms with low porosity are deformed at low strain values. If the initial porosity of the deformed sinter is low and the degree of deformation is also low, densification has a beneficial effect on the strength properties, raising them to a higher level than those in the sinters not subjected to densification. This result is mainly due to the sintered matrix hardening effect resulting from the increased number of dislocations present in deformed grains. However, even with a low deformation, densification by free upsetting has a very adverse effect on the impact resistance. The impact resistance of samples after cold plastic deformation drops to dangerously low levels. Annealing cold-formed sinters reduces their mechanical properties. The increase in the annealing temperature exerts complex effects on individual mechanical properties. The properties of the heat-treated, predeformed porous sintered metal depend on the combined effect of all phenomena related to the annealing temperature, such as healing and recrystallization of the sintered matrix, grain growth, formation of new connections between particles and changes in the size and shape of voids. The obtained test results and microstructure examinations confirm the diversified effects of these phenomena. The higher or lower mechanical properties of the sinter depend on all the changes that have been triggered by deformation and temperature in the sintered matrix and in the total volume of the material. Structural changes in cold-formed sinters, compression of closed and open pores, the destruction of connections previously formed during sintering between powder particles and elongation of particles—all of these phenomena—depend on the degree of deformation. The cracks formed in grains and breaking the connections between grains caused by deformation can be of a transcrystalline or intercrystalline nature. Macroscopically, fractures are brittle, but precise determination of the fracture mechanism based on only the results of an impact test is difficult due to partial impairment of the sinter integrity during upsetting. If a material with low porosity is subjected to small deformation, most of the connections formed between powder particles are preserved, and fractures have a brittle transcrystalline and intercrystalline nature. High initial porosity and large deformation impair the cohesion so much that brittle fractures tend to develop at the sites of partially broken connections between powder particles and along the compressed pores. The results of impact tests confirm the conclusions drawn from the fracture analysis. The impairment of cohesion during upsetting causes a dramatic decrease in fracture toughness. The effect of annealing on the type of fracture and fracture mechanism depends not only on the temperature, but also on the changes in the sinter structure caused by earlier deformation. Annealing at 650 °C a material subjected previously to low-strain upsetting removes the structural effects, i.e., the elongation of pores and particles. As demonstrated by the microstructural analysis, this annealing temperature is sufficient to complete the recrystallization of the sintered matrix. Damaged connections between powder particles are restored and, combined with the diffusion process, the close packing of the matrix in the region of compressed pores contributes to the formation of new bonds. There are areas of ductile fracture with characteristic craters on the interface, and the share of cleavage fractures decreases. The impact resistance increases and ultimately reaches a higher value than before upsetting. The increase in the annealing temperature exerts a diversified effect on the impact resistance. On the one hand, this effect increases the number of connections between powder particles and enlarges their active surface area, but on the other hand, it eliminates the matrix hardening effect. The first of the aforementioned effects increases, and the second lowers the value of the critical stress needed for crack onset. The impact resistance is additionally reduced by the growth of matrix grains accompanying the increase in the annealing temperature. Therefore, annealing at 650 °C raises the impact resistance of the samples of the material subjected to low-strain upsetting to a certain level, which remains unchanged despite further increases in the annealing temperature. In sinters subjected to large deformation, the effect of the annealing temperature on structural changes is different because the elimination of the negative consequences of deformation and the accompanying increase in fracture toughness take place along with the increase in this temperature. Fractures of sinters annealed at 650 °C still show the presence of elongated particles and pores; only a few new connections have been formed between powder particles, and there are few areas of ductile fracture. The increase in temperature gradually increases the active surface of connections between powder particles, which in turn increases the number of local areas of ductile fracture and consequently improves the impact resistance. Figure 11 shows the increase in the number and surface area of connections between powder particles that occur with the increase in annealing temperature, improving the postdeformation integrity of the sinter. The fracture of the deformed sinter in Fig. 11(a) shows that the deformed particles lying close to each other in the matrix are not connected. Annealing at 650 °C activates the diffusion process, allowing for the formation of new connections between adjacent particles. Initially, surface diffusion occurs, and in places where the matrix particles come into contact with each other, small point or linear connections are formed with numerous shallow recesses extending lengthwise and forming a network, as shown in Fig. 11(b). Higher temperature activates volume diffusion, assisting the growth of the small connections formed previously. Voids in the previously formed network gradually fill up, increasing the surface area of the necks (Fig. 10c). After annealing at 850 °C, the matrix particles are already well integrated, and the spaces between them are almost completely filled. Small pores are visible inside the connections (Fig. 10d). The improvement in sinter cohesion disturbed by deformation is one of the factors that determines the increase in fracture toughness. The second important factor is hardening of the sintered matrix, which, after annealing and recrystallization, ensures the formation of a fine-grained matrix structure with high strength and ductility. 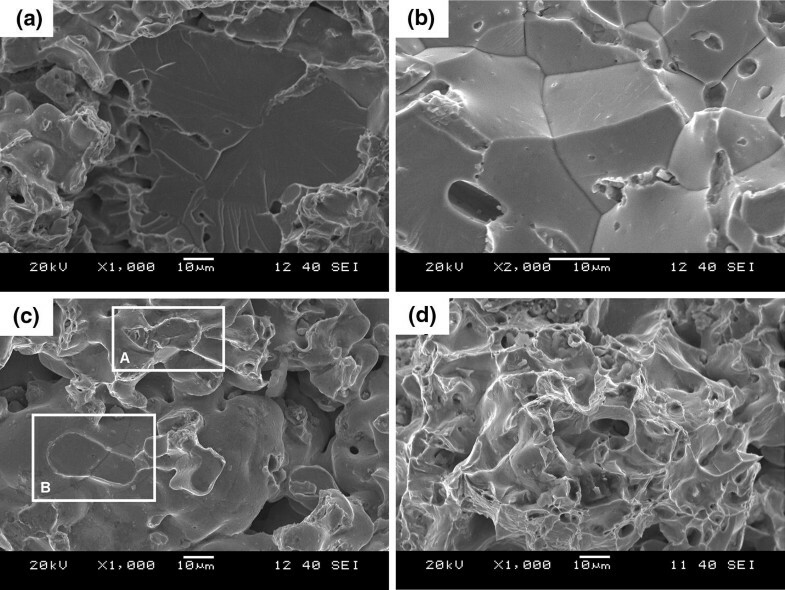 Densification of sintered products based on iron powder by cold plastic deformation is accompanied by a decrease in fracture toughness due to reduced cohesion and changes in the sintered matrix and porosity structure. The impact resistance of the tested sinters is reduced from KC = 20.5 J/cm2 for the starting material to KC = 4.5 J/cm2 for the material after deformation with a hardening parameter of ε = 0.24 and from KC = 11 J/cm2 for the preform to KC = 2 J/cm2 after deformation with a hardening parameter of ε = 0.77. Annealing the deformed sinter at a temperature below the sintering point improves cohesion, causing recrystallization of the matrix and beneficial changes in the porosity morphology. The nature and magnitude of structural changes occurring at a given temperature depend on the deformation rate and initial porosity. Upsetting a low-porosity preform with a strain of ε = 0.24 preserves the connections formed between powder particles during sintering, and annealing of these samples at a temperature just above the recrystallization point of the sintered matrix increases the impact resistance. Annealing at 650 °C raises the impact resistance to KC = 25 J/cm2, i.e., to a value higher than the value obtained in the preform and sinter with the same porosity made by the method of single pressing and sintering. The higher annealing temperature of these sinters improves cohesion at the cost of reduced matrix strength and grain growth with no improvement in the impact resistance. When a high relative strain of ε = 0.77 is applied during upsetting and the porosity of the preform is also high, changes in the porosity structure and improvement in the sinter cohesion follow the increase in annealing temperature. For such products, the improvement in the matrix cohesion and the increase in the impact resistance occur gradually as the annealing temperature increases. The impact strength KC after annealing at 650 °C is 16.1 J/cm2, and it increases to 21.3 J/cm2 at 750 °C and to 30.1 J/cm2 at 850 °C. Finally, the impact resistance obtained in these sinters after annealing is higher than that after the application of low-value deformation, but annealing should be carried out at a higher temperature. Low relative strain during upsetting (ε = 0.24) leaves the sinter cohesion unchanged. Fractures formed in the samples have a brittle transcrystalline and intercrystalline nature, typical of the sintering process, with numerous ductile areas. Application of high strain (ε = 0.77) significantly deteriorates the sinter cohesion. Cracks develop in the broken bonds between powder particles and along the compressed pores, and areas of ductile fracture occur only sporadically. Annealing a sinter deformed under these conditions gradually increases the proportional share of ductile fractures along with the increase in annealing temperature. The calculation procedures presented in this article can be useful in planning manufacturing technology for sintered products, including densification by cold plastic forming. Applied in practice, these procedures allow calculation of the value of deformation that, at a given initial density of the preform, guarantees obtaining the required final density.